This speaker has incredible Sound Quality and Range packed inside of a beautiful Design asthetic. The Controls are bizarre and the build quality leaves something to be desired. Whether you want to use this around the house, out on the patio, by the pool or in a park, the Monster Blaster will not be a disappointment. 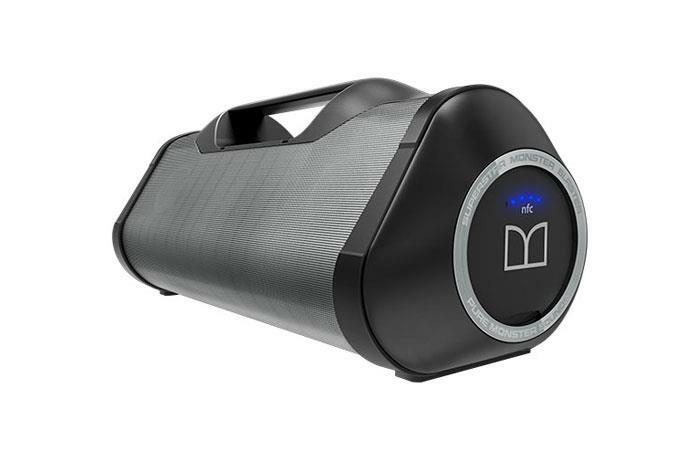 If you are looking for a powerful, portable Bluetooth speaker, the Monster Blaster is worth every penny. The Battery Life is fantastic, the volume can easily fill a small or large room, or even rock outside, without sacrificing any Sound Quality. The Controls are definitely the low point for the speaker, but the Learning Curve is easy enough to navigate that it overrides the Controls. Clearly, the Monster Blaster was designed to look and work similarly to a boombox, with better sound, and the Blaster definitely accomplishes its goal. While it looks a lot like a traditional boombox, it adds in more modern features, removes outdated features and solves some of the things that made old boomboxes terrible. For example, no need to fill the Blaster with a dozed D-cell batteries; instead it uses a rechargeable battery. No longer is there a cassette deck, but rather Bluetooth Connectivity. In sticking with the theme, though, you can connect your phone via Bluetooth and still carry it on your shoulder, though its Size & Weight might make it a slight challenge. In keeping with the boombox theme, the system also offers a mic-in option to allow for karaoke usage, a popular feature of boomboxes of the 90s. Functionally, the design performs as well. Its dual-facing speakers (front and rear) mean you can place it in the middle of a room and fill the space with sound. The angle of the speakers, facing upward on the triangular body, means you don't have to put it up high to get sound at human-level. The bottom-facing subwoofer takes advantage of the surface it is resting on to add additional bass to the system without requiring additional battery power. The placement of the Controls on the end makes it easier to carry while playing, without fear of accidentally changing the volume or turning the speaker off completely. The Blaster has 2 different ways of listening to music: 1/8" auxiliary and Bluetooth. Both offer what Monster is best known for: what they call Pure Monster Sound. The idea is that what you hear is exactly what the producer intended for you to hear. Similar to the USB mode on the Monster Elements, the Blaster offers two modes: Indoor and Outdoor. With the Indoor and Outdoor modes, you can adjust for standard or enhanced bass to support any environment. Traditionally, Bluetooth is the last resort for audio. However, with the Blaster, it is absolutely the way you are supposed to use it. Monster has taken every opportunity to ensure the sound quality is as good as possible. Even when turned up all the way, there is no distortion caused by the speakers or digital noise caused by Bluetooth. This was verified using a variety of devices running a variety of operating systems. While Bluetooth is the primary intent of the Blaster, line-in works just as well. You can direct connect your phone, MP3 player, computer, tablet: essentially any device that you might want enhanced sound from. Obviously, with line-in, there is the possibility to overload the input and create distortion by turning the outside volume up too loud. In testing, it required a tremendous amount of outside volume before the sound became too distorted. The Monster Blaster has the connections you would expect from a Bluetooth speaker of its type, offers a couple of options you might be surprised to find, but is missing one that we had hoped would be included. The standard connections that it has are Bluetooth and line-in. That gives you almost all of the abilities you could want from the Blaster. In addition, it offers mic-in for karaoke usage, which falls right inline with the boombox Design styling that Monster was going for. You can also plug a USB device, such as a phone or tablet, into the Blaster for charging. This means that the music doesn't have to end when your phone dies. We were hoping that Monster would include USB digital direct on the Blaster. If we can use an analog 1/8" cable, it is quite disappointing to be limited from using USB digital. It would definitely be a nice addition to a product that is so focused on Sound Quality, from a company that also places a premium on sound quality. The range of the Monster Blaster is fantastic. It is the longest range speaker we have tested in both practical and line of sight tests. In my 3 bedroom apartment, I can place and paired device anywhere in the apartment and bring the speaker with me wherever I am. It is not unusual to place the speaker in the kitchen with me, while my paired Surface Book is in the dining room or living room. I also use it with a Surface Pro in my bedroom and bring the speaker around with me as I clean. On two separate occasions, our team has used the Monster Blaster to play music at a cast or crew wedding reception. In both scenarios, a phone or tablet was paired with the Blaster and carried around with a team member while the speaker was placed at the head of the reception room. Tables, people, uncontrollable electronics from both people and the venue, and we never experienced any interruptions in music at either wedding. Bringing a Surface Book outside, the Monster Blaster retained a stable connection for 250 feet. Considering the Bluetooth 4.0 standard has a 200 foot range, being able to outperform the standard is unbelievable. It does, however, explain why we had no issues in any of our practical tests. Based on the sheer size of the Monster Blaster, the Battery Life is not as great as you might expect. However, the battery life that we experienced was in-line with what the company says to expect, as well as enough for your events. During our formal test, we averaged 11 hours and 36 minutes across three tests. The company claims that you should expect up to 12 hours of runtime, so our experiences were right in the expected range. The 12 hours of expected life are not what you might expect from a Bluetooth speaker of this size. While decorating for Christmas, hanging lights around the front and back of the house, taking boxes out of the attic, etc., our family decided to listen to music on the Monster Blaster. During the entire evening we had the speaker running and, when we were finished for the day, the speaker still had half of its power remaining. While a lot of the Design elements are well thought-out, the controls are definitely the limiting factor for the device. Like many Bluetooth speakers, the power button serves more than one purpose, but it doesn't work as expected. To turn the speaker on, you long-press the power button, but to power it off, you simply tap it. I have, more than once, accidentally powered the speaker off when moving it. To put the speaker into pairing mode, you turn the speaker on first, then long-press the power button again. This is the control you would expect to power the speaker off, instead of entering pairing mode. The accepted convention is to hold the power button longer on power-on, if there is not a dedicated Bluetooth button. The volume controls are well-placed and easy to access, but they do not behave as-expected, either. At this point, we have been trained that tapping a button produces an immediate response, but the volume buttons require one press to activate them, and another to change the volume. This kind of protection is unusual on volume controls, but would have made more sense on the power button. The mode button, which switches between indoor and outdoor mode, works similarly to the volume controls. In fact, all 3 buttons work in harmony. Pressing and other the three buttons wakes up the panel, and the next press activates the control. If you press the mode button while the lights are off and then press the volume up, it will change the volume, but not change the mode. Luckily, the bizarre control configuration is not a killer. We don't change the volume constantly, nor do we change the mode often. Normally, it is something you do when you first power the device on, and then set it down and enjoy our music. Because of the unusual Controls, it is not an immediate open the box and understand the system kind of scenario. However, the behavior is not so difficult to understand that you will not remember it nearly immediately. In fact, we were able to intuit the behaviors without having to read the manual ahead of time. Also, the buttons are well-labeled for their intent, so intuiting their intentions is fairly easy for anyone. Overall, the quality of materials and the materials chosen are adequate or better. The plastic used on the body is thick enough to take a beating without adding a lot of weight to the already heavy device. There are no sharp edges in the molding, there are no gaps between plastic pieces, and everything fits together as expected. On the other hand, there are a few issues. For example, the rubber covering the power button feels incredibly thin, and 6 months in is already feeling like it will wear through. Similarly, the rubber flap that covers the charging port, line-in, mic-in and USB port, is beginning to wear thin as well. Within short order, it is likely that the rubber hinge will break, exposing the ports consistently. This will undo the waterproofing of the system. The Monster Blaster is neither small nor lightweight, but it is important to note a few things here. The Sound Quality, and volume capabilities, are only possible because of the larger size of the device. With cones on both sides, as well as the subwoofer on the bottom, it is completely understandable that it is the size that it is. In addition, to be able to power the many cones and retain the Battery Life that we experienced, a large battery is also required. The battery is also going to add weight to the device, which it definitely does. The upshot here is that, when you buy a speaker designed in the style of a boombox, you know the size and weight you are expecting. The reality of the Monster Blaster is that it is actually lighter and smaller than the 2 classic boomboxes we have in the office.